After hearing some feedbacks from LabSuit users, we took a plunge and made email notifications versatile and accurate regarding the trigger events. 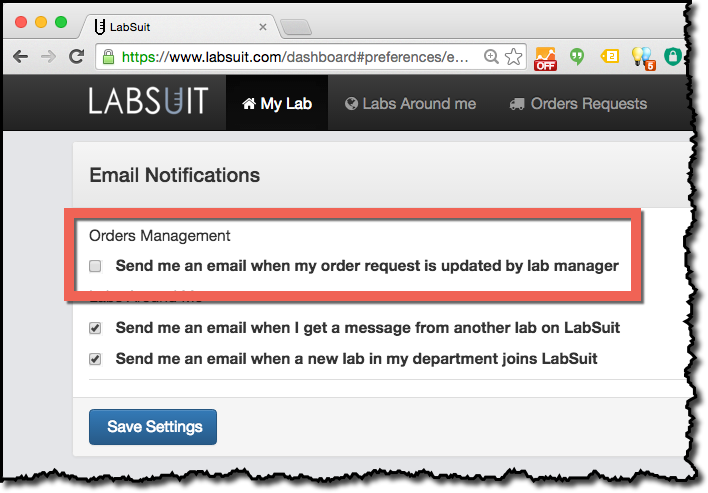 From now on, a lab manager (other lab members also) can have better control over which actions on LabSuit trigger email notifications. Today, all "Orders Management" events, such "Approve", "Mark as Delivered", etc. are grouped by a person that is acting as a lab manager. That means that I can prefer to get notifications from my lab manager. Or if I'm a lab manager, I would rather not receive email from my own actions on LabSuit. By default, a lab member gets the notifications from his lab manager.